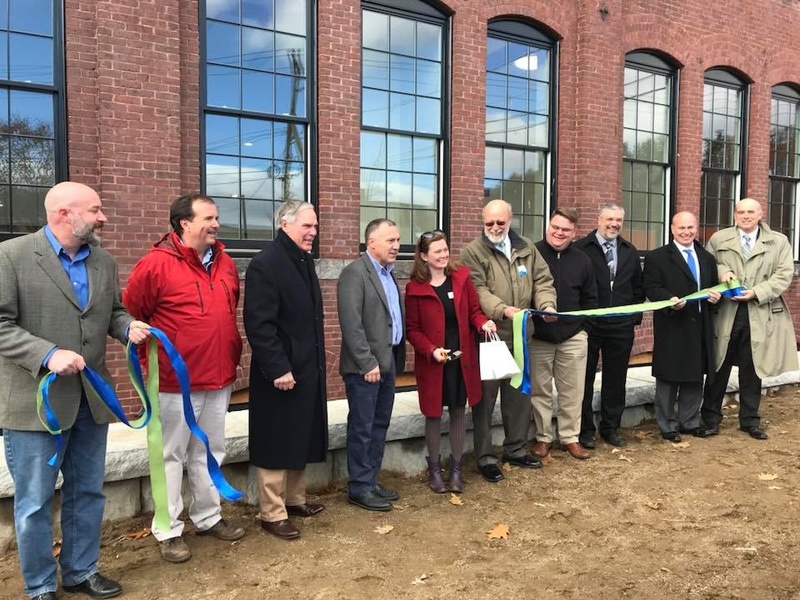 Mill rehabilitation projects have transformed communities across New Hampshire, and the Alliance has awarded several: in Newmarket, Hillsborough, Nashua, Manchester, Claremont, and Belmont. But never Franklin, the state's smallest city, until this year. Enter CATCH Neighborhood Housing, a nonprofit focusing on creating quality and affordable housing in Merrimack County. "Since I arrived at CATCH 12+ years ago, there have been many discussions about developing in Franklin," said CATCH president, Rosemary Heard. Finally, the right opportunity lined up with the former Franklin Light and Power Mill. Long vacant, the mill sits at a visible bend of the Winnipesaukee River downtown. CATCH worked with a talented team to convert the 50,000 square feet of space into 45 workforce housing units. Project partners at the grand opening in November 2017. The $12 million project included use of the federal historic tax credit, low income housing tax credit, loans from Franklin Savings Bank, TD Bank, and HUD, and a block grant from New Hampshire's CDFA. The City of Franklin will receive nearly $55,000 in annual property taxes - the first project to seed the city's TIF district. The new residents will enjoy downtown living, including nearby access to Odell Park, Main Street businesses, the library and Opera House, and hospital. This investment in Franklin matches other recent efforts to revitalize the small city's downtown, including the creation of a whitewater park. Everyone in Franklin can agree that it's nice to see light and power return to the 1895 mill.